After a full day of adventuring, it was nice not to have to think about, or cook, dinner on Sunday night. Angie had booked most of the trip for us via Costco Travel, which she found to be a more cost-effective and less labor-intensive approach than doing all the research and booking herself (much as she loves to do that). They also offered several add-ons. Her research on this showed that many were better booked through other channels, notably by using our British Airways Avios points. Based on our experience with our booked/organized excursions on this vacation, BA seems to identify some pretty solid partners. However, it did seem like the options for attending a luau were much of a muchness, so Angie did book our attendance at this event on Sunday night via Costco. The event is a bit cheesy, but there were some things about it that I really appreciated. First, a note about how the luau works and where the concept comes from. A luau is basically a Hawaiian party. Key features tend to be: a pig roasted in a buried fire pit (an imu), other Hawaiian foods, music, booze, and hula. The other food includes such dishes as lomi lomi salmon, poke, poi, and opihi. At this event, there was also cooked fish and some excellent kalua turkey, which had also been roasted in the fire pit. Angie tried the poi and said she didn’t need to try it again (I already knew that). The lomi lomi salmon was kind of salty and the poke was not as good as the poke we had from Safeway, but it was good to try some different foods. For booze at this event there were bottomless mai-tais, which Angie said were decent. I actually drank bourbon and 7-Up. For this luau in particular, there were some unique features. Being held at the Courtyard Marriott King Kamehameha’s Kona Beach Hotel, a big selling point is that the location is the spot where King Kamehameha I is said to have had his last residence. There is a Heiau just off the beach where the king held court after unifying the kingdom of Hawaii. 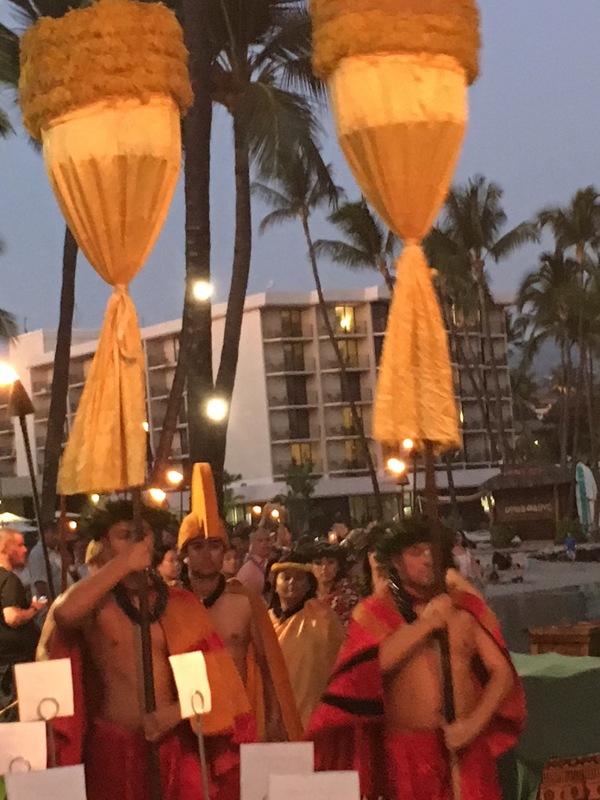 Hence, the luau begins (after a quick hula lesson) with a royal procession, representing the king and some key members of his court. 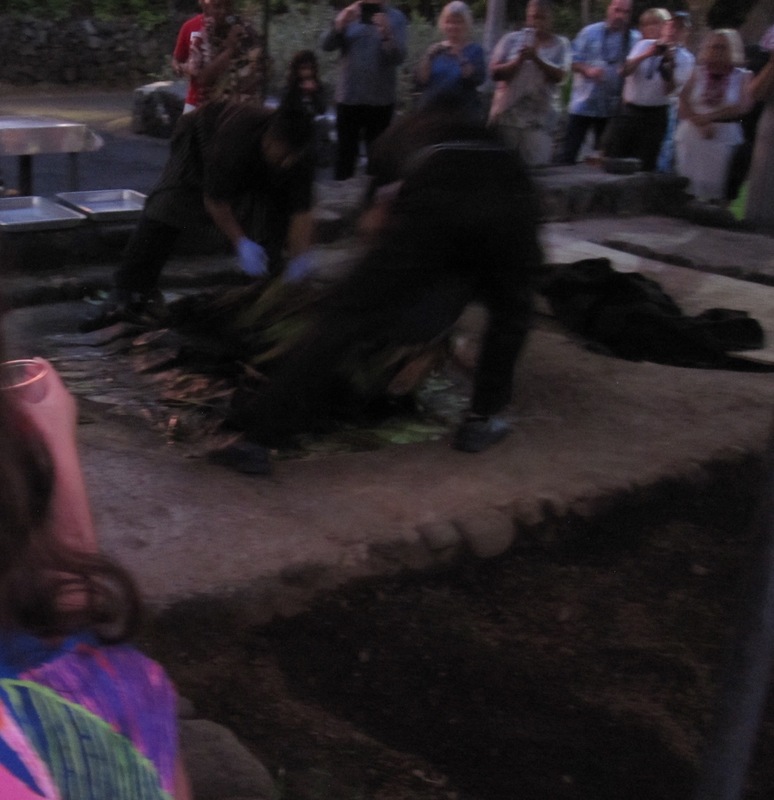 There’s also a bit of ceremony over the extraction of the pig from the firepit. Angie tried to capture it, though it wasn’t easy. After the buffet style dinner and dessert (great chocolate cake), there was entertainment, which may have been different from what I remember at previous luaus I’ve attended in Hawaii. In the past I believe there was some music and hula dancing. 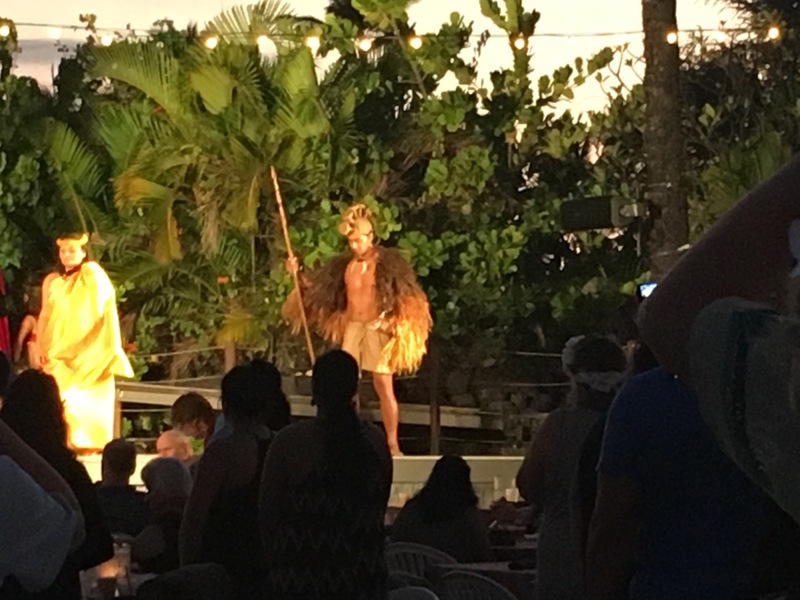 This time, there was a floor show demonstrating music and culture from islands all around the South Pacific/Polynesia, including Tahiti, Samoa, and New Zealand, among others. It was great to be able to contrast all the traditions. The floor show was topped off with a fire dancer. The event didn’t run late but we had a pretty good time. The people sitting closest to us were from Colorado, so we compared notes about life in our great state. We’ve met people from Colorado several times on this trip. Very often kindred spirits. Now, I don’t have to attend a luau! I am thinking of burying a turkey next Thanksgiving. Except neither of us tried the pig. You would probably love that. There were other foods too that you might like.